Heat oven to 375°F. Place pie crust in 9-inch glass pie plate as directed on box for One-Crust Filled Pie. In small bowl, beat cream cheese, 1/3 cup sugar, the salt, 1 teaspoon vanilla and 1 egg with electric mixer on low speed until well blended. Spread cream cheese mixture into bottom of crust-lined pie plate. Sprinkle with pecans and chocolate chips. In small bowl, beat topping ingredients on medium speed just until blended. Carefully pour topping over pecans and chocolate chips. Cover crust edge with 2- to 3-inch-wide strips of foil to prevent excessive browning; remove foil during last 15 minutes of bake time. Bake 40 to 45 minutes or until center is set. Cool on cooling rack at least 2 hours before serving. In chilled small bowl, beat whipping cream on high speed until stiff peaks form. Drizzle each pie wedge with chocolate syrup. 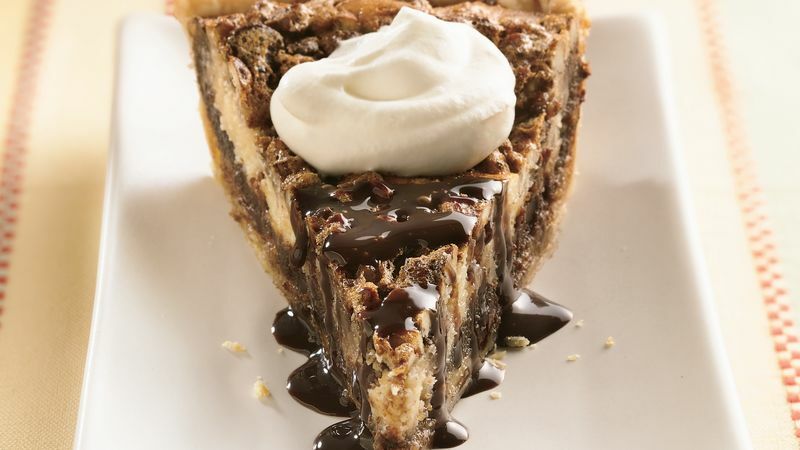 Spoon dollop of whipped cream on each pie wedge; drizzle with chocolate syrup. Cover and refrigerate any remaining pie. Instead of pecans, try making this pie with walnuts. To quickly soften the cream cheese in the microwave, place the cream cheese in a microwavable bowl and microwave uncovered on Low 1 to 2 minutes or until softened, checking every 30 seconds.